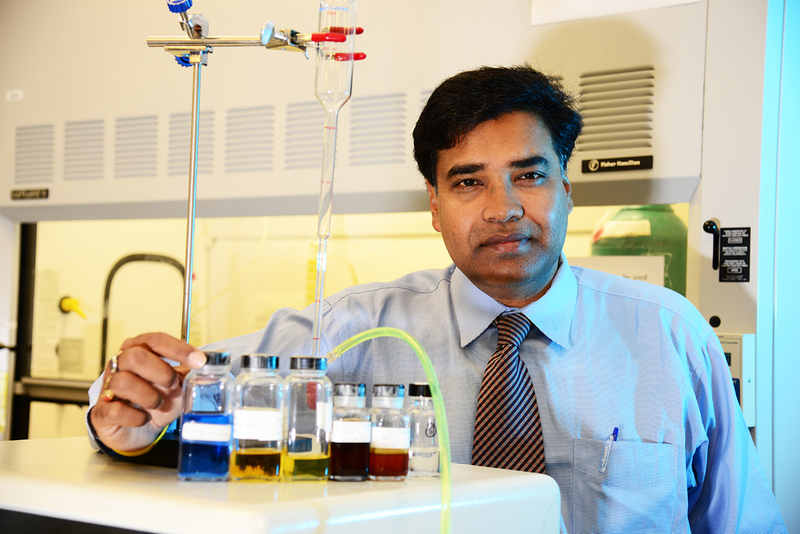 Professor Sudipta Seal’s discoveries have had applications in the fields of medicine, space and the environment. UCF engineering professor Sudipta Seal is one of only four Americans and 20 scientists worldwide named to the World Academy of Ceramics for 2018. Seal’s cutting-edge work has been cited by other scholars more than 17,000 times since 2013, according to Google Scholar, and thousands more times before that. Seal has certainly delivered throughout his remarkable career. His discoveries blend engineering, materials science and nanotechnology and have resulted in applications to medicine, space and the environment. Seal, a Pegasus Professor and Trustee Chair, has developed surface-engineered nanoscale transition metals and earth oxide ceramics that work as catalysts, which can be used in a variety of ways. For example, the oxide ceramics have led to a way to use fly ash – the dirty byproduct of burning coal – to absorb oil. The technology may be able to be used to clean up oil spills in waterways, because while the material absorbs oil, it repels water. Another potential application of the ceramics work is to create coatings that help protect against corrosion, wear and unwanted chemical reactions with other biomaterials, which may be useful to a variety of industries. “I am deeply honored by this election to the academy with my esteemed colleagues around the world and glad to see that our work is recognized amongst the peers,” Seal said. He has several degrees from the Indian Institute of Technology, the University of Sheffield in England and the University of Wisconsin, and was a post-doctoral fellow at the Lawrence Berkeley National Laboratory at the University of California before heading to working for a private company. He joined UCF in 1997 as an engineering professor of materials science and went onto become the director of the Advanced Materials Processing and Analysis Center, and later the NanoScience Technology Center. He now serves as the department chair for materials science and engineering. He has spun out his own company to take some of his inventions to market and his research is supported through grants and contracts from the National Science Foundation, National Institutes of Health, NASA, Department of Defense, Northrop Grumman and other industries. Seal also will be honored later this year when he is inducted into the Florida Inventors Hall of Fame.